1. Cross-post: When Will the Gender Gap in Science Disappear? Cross-post: When Will the Gender Gap in Science Disappear? 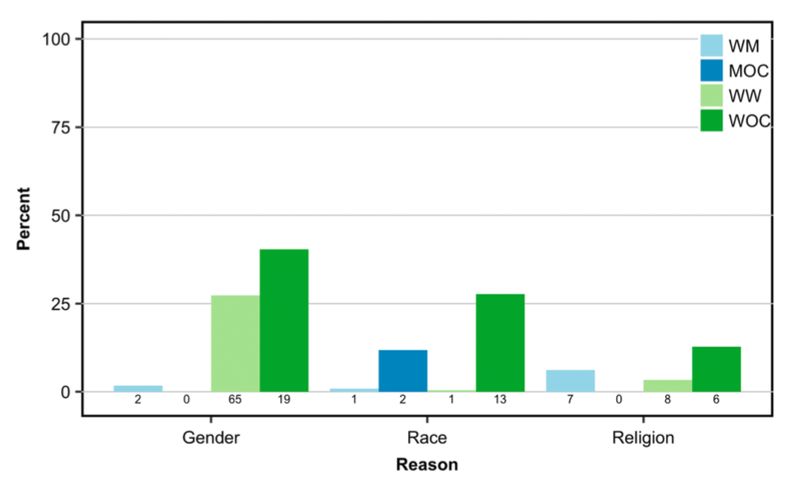 A recent paper published in PLOS Biology (Holman, Stuart-Fox & Hauser) investigated the gender gap in the Science, Technology, Engineering, Mathematics, and Medicine (STEMM) workforce by determining the numbers of men and women authors listed on > 10 million academic papers published since 2002. They find that many research fields (including computer science and physics) will likely not reach gender parity this century. They also find that women were less likely to be approached to write invited papers by journal editors. How come I hadn’t noticed these facts before? I thought I was pretty much aware of the demographics of women in physics, but the plot below distributed by the American Institute of Physics last spring had me flabbergasted. 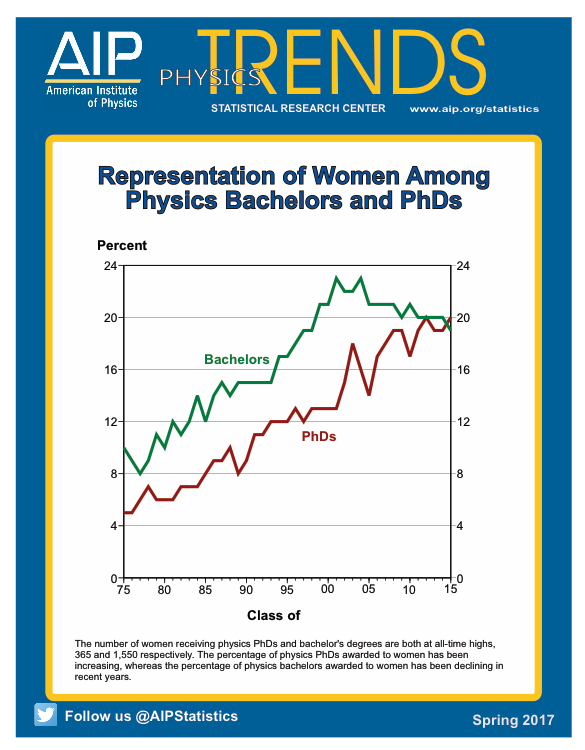 What has been going on for the past 15 years that has caused the percentage of US bachelors in physics going to women to drop from nearly 24% down below 20%? The good news is that absolute number of women getting physics degrees (both bachelors and PhDs) are at record values. And the total number of physics degrees, after oscillating around 4000 for the past 50 years, has shot up to 8000/year. Indeed, talking to physics departments around the country I hear reports of bulging enrollments and needs for moving to larger classrooms. 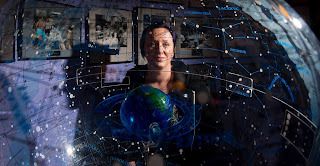 nd it very hard to believe that the market for women physicists is saturated and that out of the whole US population only 1550 young women want to study physics. 6. For SHE’s a Jolly Good Fellow? April 10th 2018 is “Equal Pay Day”. It is the day in 2018 that women have to work until to earn the same as men did in 2017. In fact, this isn’t even a true statement. For women of color Equal Pay day is later in the year: https://www.huffingtonpost.com/entry/equal-pay-day-is-not-equal-at-all-for-women-of-color_us_58e3ec04e4b09deecf0e1af4. In 2016, white women earned 77 cents on the dollar compared to what men earned; African American women earned 64 cents on the dollar and Hispanic women only earned 56 cents on the dollar. Within academia in the US, women earn 80 cents on the dollar:https://www.aauw.org/research/the-simple-truth-about-the-gender-pay-gap/. As a white woman, and a woman with a tenured position, I acknowledge my privilege amongst women. I am sharing my story about pay and gender inequity knowing that it could be worse. Last year, on Equal Pay Day 2017, I sent the (male) chair of my department an email regarding my pay compared to that of a colleague. It’s always difficult to compare faculty salaries. Our paths to tenure and promotion are all different. Our research topics are always at least somewhat different, so making a direct comparison is tricky. But I happen to have a story in which we come as close as ever to direct comparison. 1. Where Are We on Harassment? 5. Why Aren't There More Women Leaders in Science?